You know you’re in for something special when a giant brass chandelier and soaring white columns greet you at check-in. This newcomer to Beverly Hills has been heavily scrutinized, but has lived up to all expectations, including state-of-the-art room technology, a 5-star spa and a larger than life design. 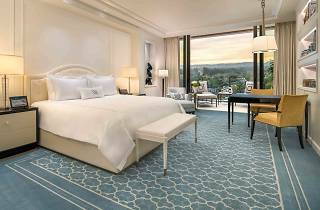 These days, a new hotel in Beverly Hills with any hope of breaking into an already crowded luxury market has to deliver the full package. And this lavishly designed, $200 million project, which took 10 years, certainly does. 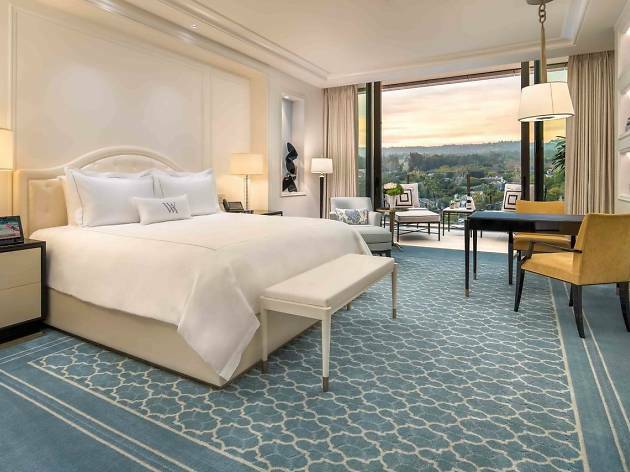 Waking up at the Waldorf Astoria Beverly Hills is a treat: the Art Deco rooms all have floor-to-ceiling windows and private balconies, and the gleaming bathrooms come with bluetooth-connected speakers. When you need to adjust the lighting or call for room service, there’s a dedicated in-room iPad, so it’s like having your own personal control center. You can even text the digital concierge—day or night, anytime—to ask about securing restaurant reservations or tickets to a show. The famous Iranian designer Bijan operates a boutique next to the lobby, so you can even do your shopping in the confines of the hotel. When you’re ready to emerge, there are Rolls Royce and Maybach house cars to take you around the city (within a 3-mile limit). Dinner at Jean-Georges Beverly Hills is a treat, with dishes like tuna tartare and avocado pizza proving to be the best sellers. If you’re not ready for the evening to end, head upstairs to Rooftop by JG for more cocktails and one of the best views in Beverly Hills. Location: Commanding a 9-acre site at the western bounds of Beverly Hills, this hotel is within easy walking distance of high-end designer shops along Rodeo Drive, and offers all the museums, galleries and upmarket restaurants that this billion-dollar neighborhood is known for. Beverly Gardens Park: Walk 15 minutes from the hotel to reach this 1.9-mile haven of glimmering green lawns and an illuminated Electric Fountain. Go ahead and take a selfie at the famous Beverly Hills Sign, you know you want to. Beverly Center: If you’re looking for a bit of normalcy to balance out all the high-end, this shopping mall is targeted toward the masses, with outlets like Marshall’s, Saks Off Fifth Ave and Uniqlo, and sits just 2 miles from the hotel. Good for: Luxury travelers with a thing for big, bold design and a need for privacy will gravitate toward this feat of hospitality engineering. Doting couples and busy business travelers, in particular, will get the most from the tech amenities, which put all of the hotel’s resources at your fingertips. Time Out tip: This is the only place in Los Angeles certified to offer spa treatments by La Prairie, a highly regarded skin care laboratory based in Switzerland—so if there was ever a time to splurge on a caviar facial, or try something called a Diamond Perfection Body Treatment, this is it.